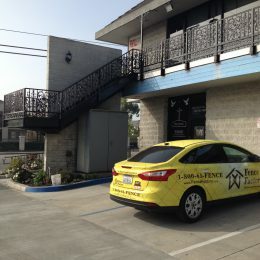 If you need a fence for perimeter protection, ornamental is the way to go. This type of fence provides excellent security while remaining aesthetically pleasing. 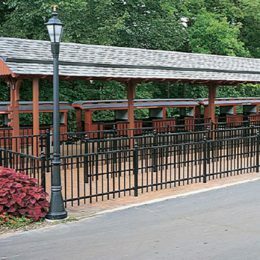 Not only is ornamental fencing highly customizable, there are also many practical applications for ornamental fences. A major benefit to ornamental fences is security. They can be extremely difficult to climb and are among the more effective types of security fencing available. They are nearly impossible to tear down and a tall wrought iron fence with sharp cap posts are also nearly impossible to scale. Ornamental fences are also customizable to fit any of your needs. 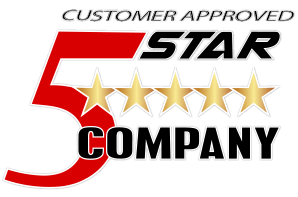 However, because of this they require a complex installation process that should be handled by a professional fencing contractor. 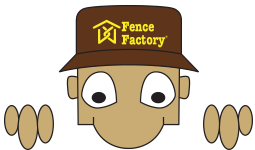 There are different types of ornamental fencing, the two most popular are aluminum and iron. Aluminum fencing is known for being more maintenance free than other types of fences. Because you choose the color of your aluminum fence, you are not required to paint it. Another advantage is the different styles that are available. Also, you have a choice in the quality of the aluminum you require. There are more affordable residential quality aluminum fences and more expensive, endurable industrial grade aluminum fences. However, aluminum fence is more prone to damage than a wrought iron fence. Aluminum is not built out of the same heavy duty metal as wrought iron. Installation can also be a disadvantage, since aluminum fence requires more specialized tools to install it than other types of ornamental fence. If you need a fence that will require heavy usage because of lots of wear and tear, then a wrought iron fence is a better option. A wrought iron fence is known for taking on much more heavy usage because of the materials it is made out of and they can last for many more years than traditional fencing. There are Pre-Galvanized and Hot-Dip Galvanized choices available before painting or powder coating for extra-long life and to keep from rusting. However, some customers believe the rust adds to the character of the fence. Wrought iron fence is less flexible than aluminum fence. It also may not be the ideal metal for a landscape that has a steep grade. Because it is easier to work with, production costs for aluminum fence can be lower than that of wrought iron. Our fence experts can assist you in choosing the best type of ornamental iron fence for your landscaping, security and budgetary needs.